Alabama: Audemus jura nostra defendere. This day of driving was the only one where I was really racing against the clock, trying to get to Montgomery before the sun went down. Dusk was rapidly approaching and I had about 150 miles of Alabama between the state line and the state capital. Since it was only about 3:00 I knew that in order to get down to Tallahassee and back again, I had to get moving. Otherwise it would come down to a choice between abandoning the planned excursion to Tallahassee, with the climax of the Florida Recounts expected imminently, something I didn't want to do; or extending the drive home to a fifth day, which I really didn't want to do. Ultimately I would do neither of those two things. And, ultimately, I would lose my race against the clock, as I'm sure you've deduced already. 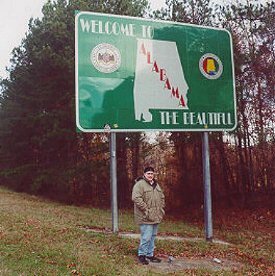 After a little maneuvering through the streets of Montgomery -- the only map I had was an inset in my Rand McNally that managed to cram 100 square miles of map into a box less than two and a half inches wide -- I made it to the Alabama State Capitol at around 6:00. 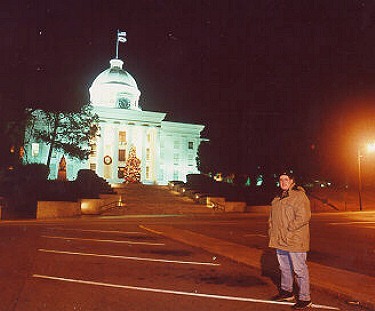 Alabama's capitol was built in 1851. It replaced the previous capitol, built in 1847 no state funds for either the building or the land; it was all financed locally, partially by a $75,000 bond issue. Two years and eight days later, the old statehouse burned to the ground. The present building was constructed on the foundation of the original. It was expanded and renovated several times: the east wing was begun in 1885, the south wing was built in 1905 and 1906, and the north wing was added in 1911. The east wing was expanded again in 1992. Of all the driving I did on my Dallas road trip, I did more driving off the Interstate system in Alabama than anywhere else. It must be an east-coast bias or something, where if you're driving on a U.S. highway as opposed to an Interstate that means you're going through towns every other mile, stopped at traffic lights, or slowing through speed traps. And indeed where I have lived (Long Island, which has no U.S. highways, and New Jersey, where the above is certainly true) that has been the case. Coming out into the "real" America, it took a little getting used to to remember that there is more to life than just Interstates. Secondary highways can get you where you want to go just as fast and sometimes more directly. So right next to the Mississippi line, I bid adieu to the Eisenhower Interstate System and ventured off into Alabama. I had first gone to Alabama in 1991 when my parents enrolled my brothers and me in Space Camp, which remains the only real summer camp I've ever done. My older brother took part in a program that was oriented towards fighter pilots as opposed to astronauts. The younger campers participate in "Space Camp" whereas older kids, like me at the time, go to "Space Academy." We were involved in two separate shuttle missions during our week there, and had different jobs in each to give us more exposure to the variety of tasks involved. On one we were assigned randomly to a job (I was on the space station), and on the other they gave us a little quiz. I had the highest score and thus was named shuttle commander. We even used the same simulator as was featured in the movie SpaceCamp. At the end of the week they have a ceremony with all of the other teams that are there and the best of the best received awards. And who won the Right Stuff award? It just happened to be someone from my own hometown who would sit two seats down from me in band rehearsal the following school year. This page loaded in 2.624 milliseconds.